Say it with me, T-A-S-M-A-N-I-A-N whisky — an expression from 'down-under'! The Lark distillery is located in the town of Hobart, Tasmania, and only produces a little over 14,000 liters annually. This was a bottle I had to track down, but with the help of Lark's Master Distiller, Chris Thomson, I was able to special order a bottle towards the end of 2012. 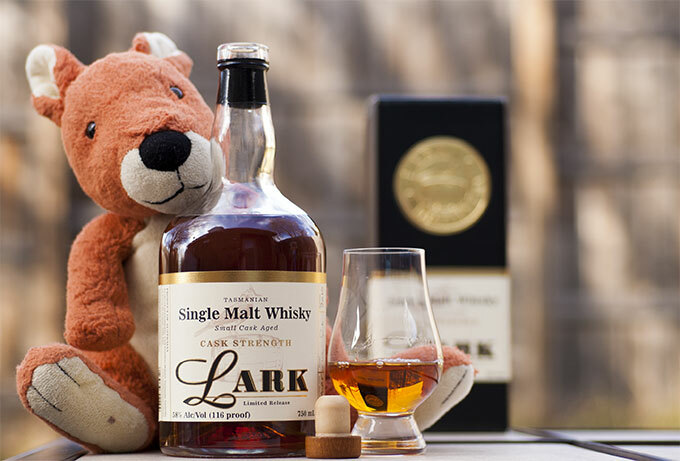 Lark is a unique whisky from Tasmania, that uses a specially developed Tasmanian barley and smoked using locally cultivated peat — yes, you ready that right bog heads, Tasmanian peat! The provenance of the ingredients in combination with the maturation in 100 liter Port Quarter Casks creates a whisky that is sweet and fruity, while a smokiness wafts around the edges. I had planned on reviewing the Cask Strength Lark during my Christmas break, but a sudden outbreak of the flu brought to our house by visiting family put off my plans until February of this year. You would think Tasmanian whisky would be more prolific worldwide, considering Australia opened their first distillery in 1822, a full year before the Excise Act of 1823 which allowed for the first legal distilling in the United Kingdom. If not for the governor of Van Diemans Land the original European name for Tasmania) forcing early distillers out of business in the early 1830's, and outlawing distilling outright in 1839, it's possible that development of whiskies from the southern hemisphere could have paralleled Scotch whisky. Distilling in Tasmania wasn't again allowed until 1901, but the changes to the law still required distillers to use a still with a minimum 2700 liter (713 US gallons) capacity. It wasn't until 1989, when William Lark took to lobbying local politicians and embarking on a legal battle, that steps were taken to relax the oppressive regulations on distilling and Lark Distillery opened — 150 years after the last legal distillery in Tasmania went silent. Lark Distillery, opened in 1989, is named after founder William Lark. View a high-resolution version. Opens with fresh grass and orchard fruits, dripping in a vanilla and honey coating with a slight nutmeg-infused raisin note that lingers in the background. The nose bears a similarity to Penderyn's Maderia cask, but its composite is far more balanced as the notes well orchestrated rather than fighting for dominance. I was expecting more from the Port cask, but overall a solid opening. Orchard fruits abound; a highly intoxicating cornucopia of apples and pears mixed with a subtle amount ginger. Again, the malt drips rich vanilla off the palate allowing this big, oily whisky to seek out and cover every inch of your mouth. The smokiness isn't forward in this malt, it's not a big peaty whisky, and perhaps that is due to the source of the peat. Instead, the smoke makes its presence known at the end — like a magician pulling his cape from atop a stand to show the audience a smoke filled space where the fruits were once present. A long, lingering, spicy finish you'd normally experience with an Ardbeg or Balcones Brimstone, but without the peat or BBQ aftertaste. Fantastic! I have to hand it to the team at Lark, this is a big whisky, and one I look forward to trying again and again. A dram of Lark — with thanks to my son for allowing me to borrow "Joey".